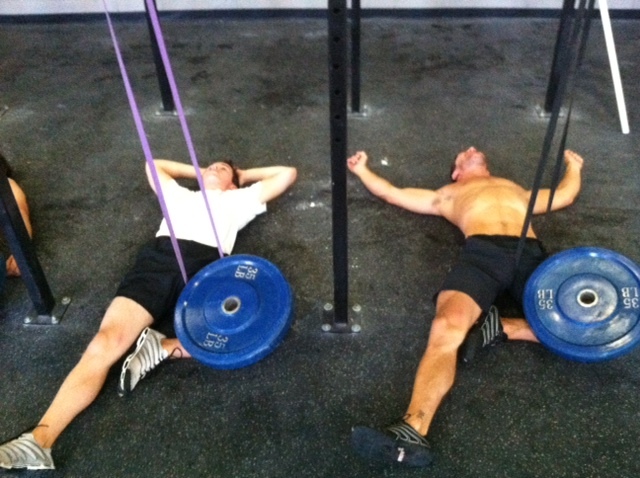 NOTE: There is NO rest between different lifts…this WOD is 21 minutes straight through. You may use different weights for each lift, but prepare accordingly. Hi friends! I’m back from Germany but sick sick sick. See you when I am well again and not sick. p.s. Guess what the Germans eat for breakfast. Bread! With a side of bread. And some bread on top. With a bread sauce. Welcome back. Sorry you are sick, sick, sick. Does it have anything to do with the bread, bread, bread? I could have and should have gone heavier on the HPC and the PC. I tried 130 for the squat clean and got a lift or two at that weight, but my brain wouldn’t allow me to drop under the bar. I can squat clean 130 and more, but I have to warmup to it with light squat cleans first. Very telling workout. I need to practice heavy squat cleans. A lot harder than it looks and I need to practice squat cleans. Much harder than I thought. Glad I pushed myself and started to actually feel my hips pop today and get under the bar. It was hard to guage where to start. The HPCs and PCs weren’t hard at all and I could have done more. The SCs were a real challenge. I can clean it and catch in a squat with no problem, but its so hard to stand up! I struggled but didn’t miss any because of plenty of time to rest. Good workout and excellent coaching by Emily. Failed the first attempt at 155 on the Squat Clean then went down to 135. Could have done more on the Hang Clean. 70/80/75. Coulda done more weight but left hand kept going numb…annoying and mysterious. Did this a day late cause it looked so fun! Probably should have done a little more on the hang and power cleans, but the squat cleans were a good weight — did a pretty good job catching them in a squat but the last 4 or so were hard to stand up.